sea level rise in our building design process. As climate change causes sea levels to rise by as much as 6’ over the next century, our cities will be required to redefine their relationship with water. 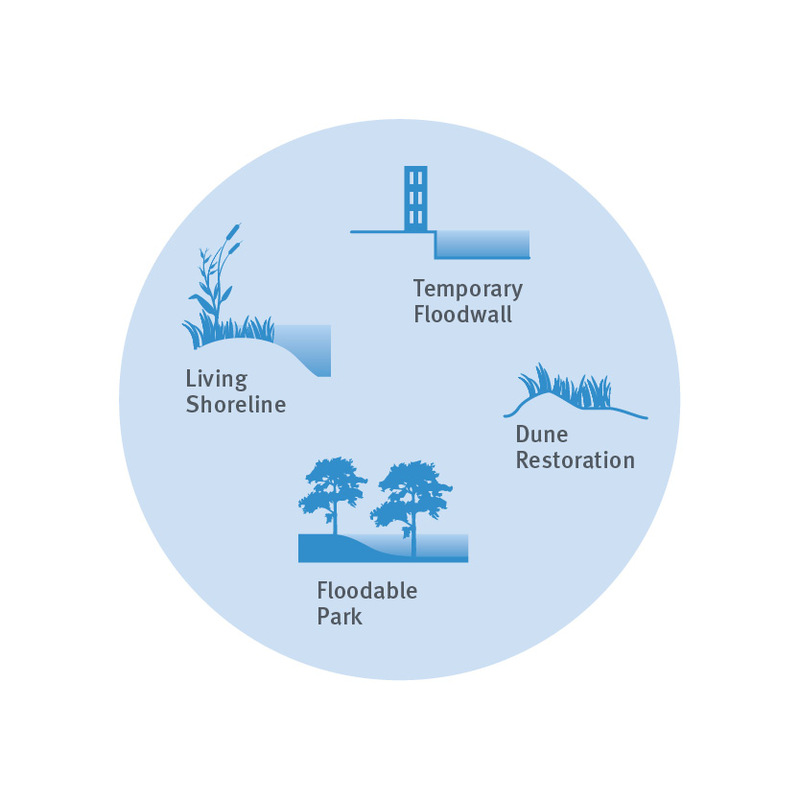 Architecture, circulation networks, and green space must all be designed to be resilient and to expect frequent inundation. Sponsored by the Urban Land Institute Boston and The Kresge Foundation, Arrowstreet took lead roles in the day-long charrette and subsequent report for “The Urban Implications of Living with Water” initiative. Sea level rise implications for the Greater Boston region are significant due to the proximity of these communities to water and former marshland. Four sites in and around Boston representing various typologies were selected for analysis by interdisciplinary teams. Four common themes emerged from the analysis of these sites. The intent is for these strategies to be generalizable to other geographical locations. Read the full Living with Water report. Charette teams identified building-specific and district-wide solutions that could be implemented in coordinated phase to protect assets. An on-going process is recommended to continually monitor, asses, and propose solutions to climate change. Using the dynamic planning process, an adaptive masterplan was proposed for the Innovation District which would evolve over time to mitigate rising sea levels and more frequent storm surges. In addition to the new Harborwalk, the street network, utilities, and buildings would be modified each decade to adapt to rising sea levels. We have time to create a more resilient built environment through a phased process and incremental improvements that account for development cycles, infrastructure lifecycles, evolving conditions for financing and the changing insurability landscape. 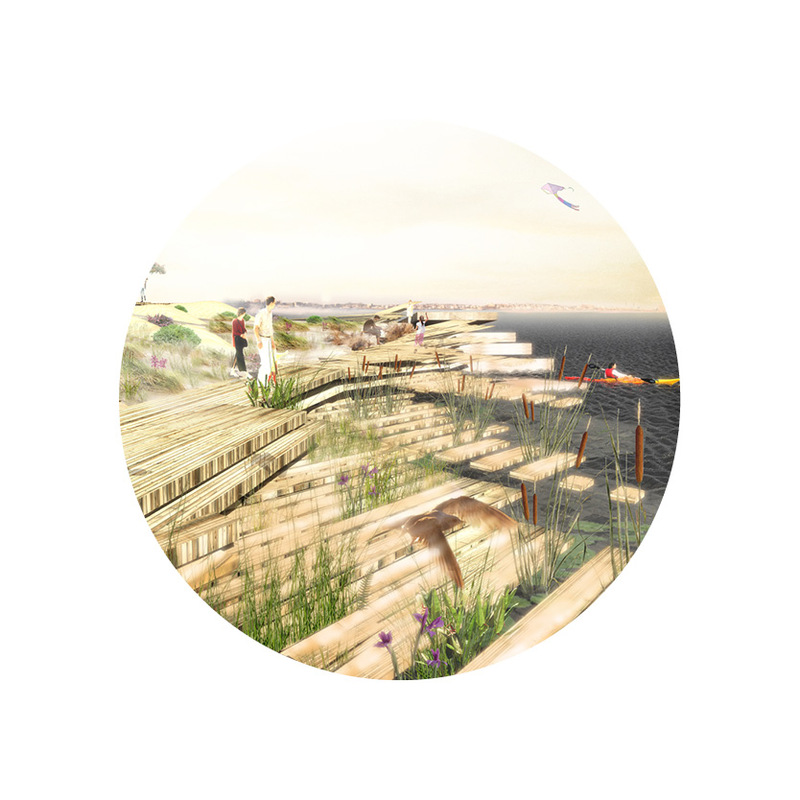 Raise Harborwalk to serve as a seawall to protect against storm surges. Implement green infrastructure solutions and best practices for low impact development (LID). Take future conditions into account when sizing and designing drainage systems. Include tide gates at outfalls, which should be above low tide mark as much as possible to allow the system to drain eventually. Develop a long-term master plan for the district to address water management and issues of climate change. Raise pedestrian elements to protect buildings during increasingly frequent ooding. Begin conversion of basements, as current uses such as parking are likely not possible. Relocate critical service utilities beneath raised sidewalk. New grates installed for building protection drain back to existing drainage systems. Green infrastructure reduces strain on drainage system during dewatering following inundation events. Drainage system stays as conduit for storage systems beneath buildings, which now have large pump chambers for dewatering of basements repurposed as water storage. Tunnel network beneath buildings “knits” the underground systems together in a regionwide approach.